Most people have a lot of responsibilities to take care of and the cleaning tasks usually come last on their list. You can solve the problem with the hygiene in your home and commercial property using our excellent cleaning services. They are the best solution to maintain your office, home, upholstery, carpets and possessions. Use the professional help of our cleaning staff and you will be pleased with the result. 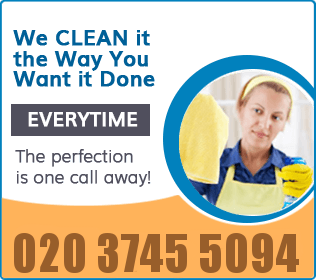 Our cleaning services are suitable to be used by the residents of Acton W3 one off and regularly. If you need any of these services get in touch with our customer supporters to schedule them and receive your individual quote. It can include as many services as you need. We offer one off and regular domestic, office, oven and window cleaning. Our staff can provide one off spring, end of tenancy, after builders cleaning and other services. All of our cleaning employees are qualified, skilled and have been trained to do their work professionally and achieve the desired results. They can sanitise your upholstered pieces of furniture, carpets and cooking appliances. The cleaning products which our staff apply are effective and non-toxic. Order any of the professional cleaning services which you need that we provide in Acton W3 to keep your home and business property hygienic and spotless. If you look for qualitative and properly done cleaning of the appliances, furniture, windows and whole rooms in your home or other property, get in touch with us. Our company offers inexpensive and professional cleaning of houses, flats, offices, carpets, sofas and electric appliances. Let our cleaning staff ensure the impeccable condition of your rooms and belongings. We offer reliable and qualitative cleaning services to the residents of Acton W3, provided seven days per week at affordable prices. You can order your cleaning by calling us, sending us an e-mail, using our online chat or booking form.